Dog Collars & Matching Leather Bracelets | Original Designs - Superpipapo: In Style with Your Pet! 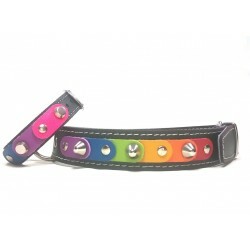 Dog Collars with Leather Bracelets There are 5 products. The rainbow expresses freedom and happiness. Therefore, this original exclusive leather dog collar and bracelet design for dogs and owners that are free and happy and do what they want to do! 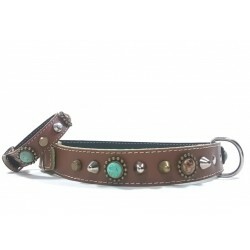 This unique Studded Collar for big size dogs has a stylish look with beautiful nature and turquoise Polaris stones . An Unusual strong Design! Set of leather collar for large dogs and bracelet with Beautiful Red Coral style Polaris stones - Fashionable and striking! 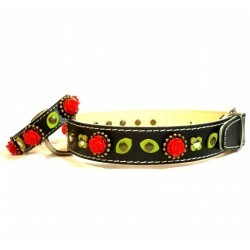 An original size collar and bracelet with beautiful red roses in ornaments and green leather leaves on black leather. Your dog and you become famous with this design!